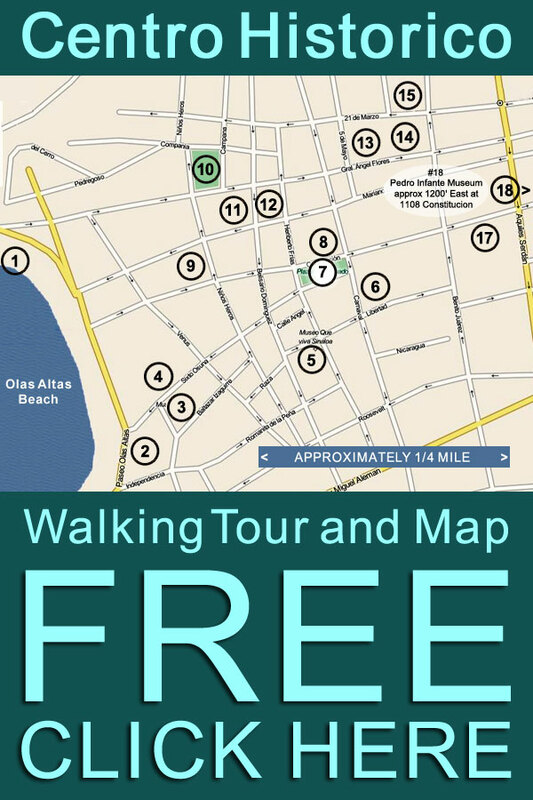 47 recommended Mexican restaurants in Mazatlan Mexico! Mexican restaurants in Mazatlan are as good as it gets -- anywhere in Mexico. 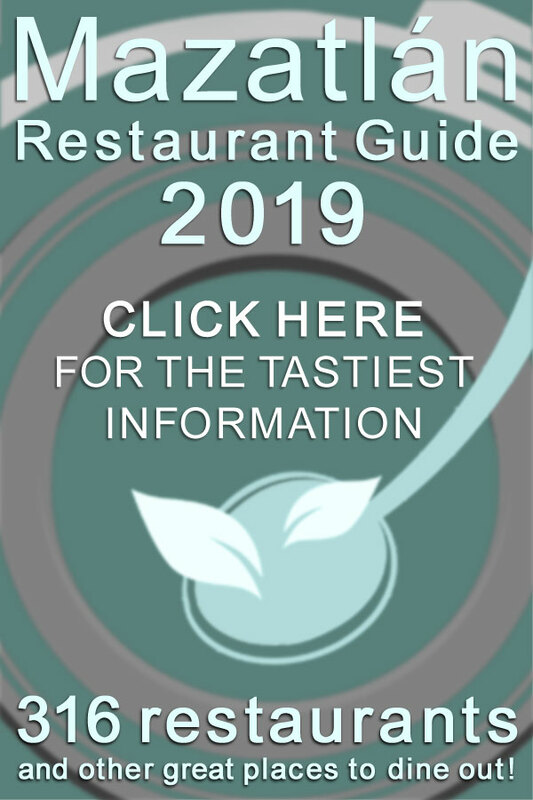 With a solid culinary underpinning that is based upon fresh Mar de Cortez seafood, great Sinaloan meats and fresh produce, these 47 top rated Mexican restaurants in Mazatlan deliver consistently superior Mexican cuisine. Mazatlan Mexican restaurants are a particular treat for Americans and Canadians more familiar with popular inland cuisine from the interior of Mexico and far from the coasts -- which has very little seafood -- and are delighted by Mazatlan's version of a Mexican meal that can include every type of seafood imaginable! 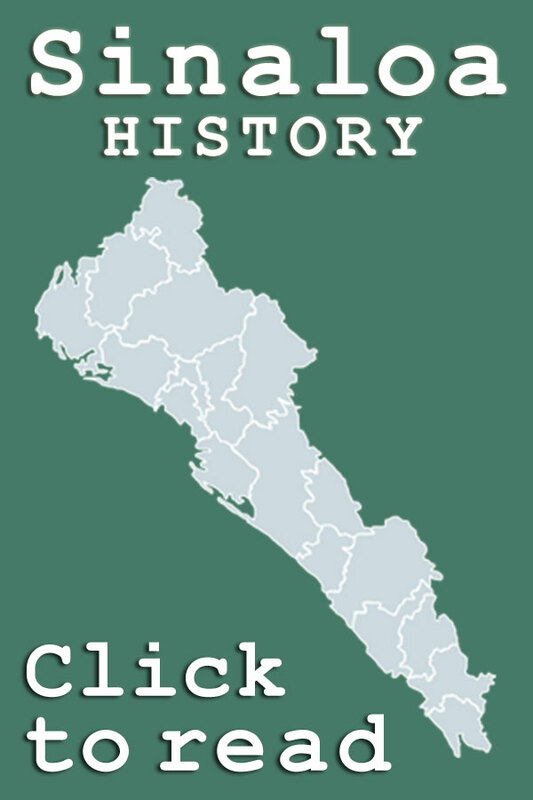 These 47 recommended Mexican restaurants, cenadurias and food trucks also often serve unusual Sinaloan Mexican foods such as Chilorio, which is fried shredded pork seasoned with chile ancho sauce, or Caguamanta, a mixture of shrimp and stingray cooked in the style Loggerhead turtles used to be prepared before their harvesting was outlawed. 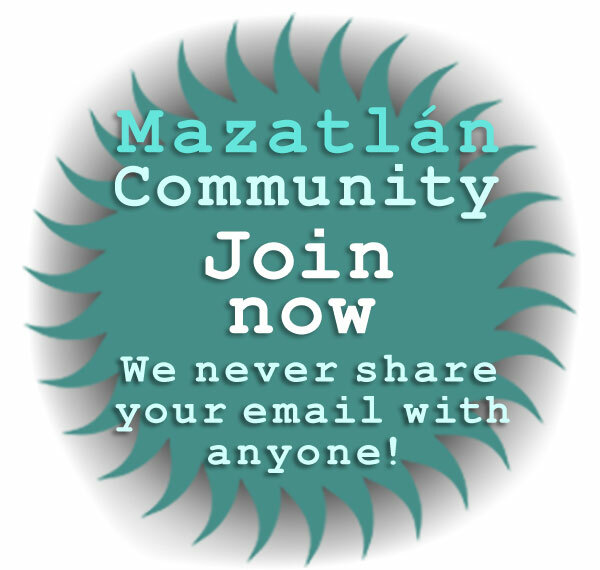 Enjoy a meal at one of Mazatlan's best Mexican restaurants -- delicious authentic Mexican dining at its best! Baja Style in Mazatlan serves up delicious Mexican meals that delight and satisfy. With a substantial menu that offers everything from tacos, quesadillas and north-of-the-border stuffed burritos -- not necessarily easy to find in Mazatlan! -- to a range of fresh ceviche's. Baja Style also knows how to prepare vegetarian versions of most of its menu items, and is highly recommended as a place for vegetarians to get delicious inexpensive meals in Mazatlan. Skateboard-themed and lots of fun, Baja Style serves bottled and draft beer. Seating is outdoors. Baja Style is open from noon - 11pm daily, does take-out and accepts Visa and MasterCard credit cards. Casa del Mar (formerly La Palapa del Mar) Mexican restaurant in Mazatlan is a huge restaurant inside a gigantic palapa, located on the beach side of Torres Mazatlan Resort -- about five miles north of El Cid Marina on Avenida Sabalo Cerritos. Casa del Mar Mexican restaurant has windows that can be closed when the weather cools, and white tablecloths and fresh flowers that provide a colorful and relaxing atmosphere. Casa del Mar that has both indoor and outdoor seating. The Casa del Mar menu is an excellent mixture of Mexican and American dishes. Breakfast, lunch and dinner are served daily. Casa del Mar in Mazatlan also has diet dishes. One hallmark of Casa del Mar restaurant is the service, which is consistently excellent. 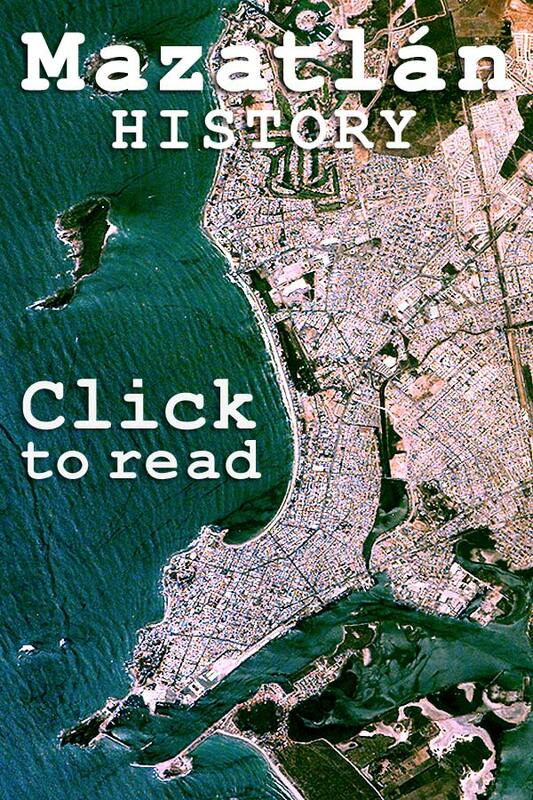 Reviews and information about the best food trucks in Mazatlan! Casita Maria has upped the game for food trucks in Mazatlan. The creation of Mazatlan-born United States trained Chef Jamie Llanos, Casita Maria serves sophisticated versions of Mexican dishes such as seafood (think octopus) casseroles, or spicy Middle Eastern flavored tuna tostadas. Ever been served wine from a food food truck? At Casita Maria you can have your gourmet food truck dining experience accompanied by artisan-crafted wine from the Guadalupe Valley. Located within La Trockeria, the area for food trucks across from the El Cid Marina, Casita Maria is open from 6pm until late evening Wednesday through Sunday, closed Monday and Tuesday. They say that when a restaurant stays in business for a long time that it usually serves really good food, and Cenaduria Chayito -- located in Centro -- has been a favorite of Mazatlecos for over 50 years! Cenaduria Chayito serves all of the delicious and filling traditional inexpensive Mexican meals that you would expect. What isn't necessarily expected is Chayito's gorgeous Bouganvilla-shaded courtyard, which provides cool (or "cooler", in the Summer months!) open air dining. Cenaduria Chayitos pozole and carne asada are particularly highly recommended. Cenaduria La Copita is the Real Deal. Traditional Sinaloa Mexico meals served in a simple clean environment at very low prices! Cenaduria La Copita is a Mazatlan tradition that has been around for generations. Their Pozole is fantastic: a delicious red broth with pork, chicken and maíz nixtamalizado -- sometimes confused with hominy, which is made in a different way. No bones, no chemicals, just delicious natural flavors! Cilantro's restaurant in Mazatlan features quality Mexican seafood and steaks. Cilantro's Mexican restaurant in Mazatlan is located on the beach at the Pueblo Bonito Emerald Bay, one of Mazatlan's finest resorts. Cilantro's thatched hut palapa style dining room has a warm casual elegant feel as you watch the waves roll onto the beach below. Cilantro's serves a popular grilled Mexican seafood platter for two that includes lobster, shrimp, calamari, octopus and grilled catch of the day, and has a nice wine list and excellent drinks. Cilantro's is a romantic place for a sunset Mexican seafood dinner. Service is excellent. Copa de Leche in Mazatlan is a long-established restaurant prized by residents and tourists alike for its authentic Mexican cuisine and ambiance. Located right on the Malecon at Olas Altas beach, Copa de Leche offers a beautiful ocean view from their shaded sidewalk cafe, and an economical comida corrida which is is served all day. The Copa de Leche menu includes Pechugas en Nogada (chicken breast in pomegranate-pecan sauce); Alambre Barbecue (a traditional BBQ beef dish cooked with onions, peppers, mushrooms, ham, and bacon); Tamirind Shrimp; and a truly delicious and hearty Sopa de Mariscos -- fresh squid, shrimp and fish in a tangy broth flavored with lime. Copa de Leche also offers indoor seating -- and a bar made out of an old wooden fishing boat! Copa de Leche opens at 7am for breakfast, serves lunch and dinner until late at night, is open every day except Tuesdays, and accepts Visa and MasterCard credit cards. El Aljibe de S. Pedro is located on Constitución in one of the most spectacular spaces in the Mazatlan Centro Historico. Housed within a massively vaulted 150 year old cistern -- one of only three that supplied Mazatlan's water in the mid-1800s -- this restaurant is a mesmerizing combination of ecclectic art gallery and dining establishment. Owner Jose Perez has filled this cavernous space with a stunning collection of antique objects of all types: sewing machines; signs; crosses and milagros; dolls (and doll parts); old books; candles; model airplanes and musical instruments suspended from the ceiling; free-standing antique doors; a red leather barber's chair -- and contemporary paintings that are primarily the work of Mazatlan art students. The menu at El Aljibe, while mostly Mexican (usually with a twist, like smoked marlin gorditas), is equally ecclectic and includes non-Mexican food like traditional steaks, pasta dishes, chicken and beef entrees and salads. Shrimp, obviously, play a role in the menu. But did you expect your shrimp to be dipped in a plum, peanut and peach sauce and wrapped in savory bacon? As befits a restaurant space that could just as well be used as a massive wine cellar, El Aljibe de S. Pedro offers a substantial selection of Spanish, Chilean and Argentinian wines by the bottle, as well as house wine by the glass. Large golden antique letters on one wall of the vault spell out "Que Onda" which translate as the question "What's happening?" The answer: El Aljibe de San Pedro! El Aljibe de San Pedro is open from 5 pm to 11 pm Tuesday - Saturday, cash only. For excellent grilled Mexican food try Restaurante El Bambu next to La Gran Plaza. One of our recommended Mexican restaurants in Mazatlan, El Bambu is only slightly outside the Golden Zone, conveniently located next to Grand Plaza shopping center and near the intersection of Camarón Sábalo and Rafael Buelna. Restaurante El Bambu was founded in 1992 and has grown to substantial dining space that can seat 200 comfortably. Primarily patronized by Mazatlecos, El Bambu's Arrachera is highly recommended and especially good. The restaurant serves beer, mixed drinks and spirits and provides free WiFi. El Bambu delivers to most parts of Mazatlan. El Mil Amores is a sophisticated addition to the Marina Mazatlan restaurant scene. Located at Marina Mazatlan, El Mil Amores provides delicious Mexican food in a casual environment decorated with large old-stlye graphics celebrating Mazatlan-born Mexican movie star Pedro Infante and modern large screen TVs. El Mil Amores Marina has the wonderful smell of smokey cooking. The menu created by Chef Gilberto de Toro offers a wide range of traditional Mexican dishes and the environment couldn't be better. El Mil Amores Marina takes reservations, has both a parking lot and valet parking, and delivers. The restaurant also accepts Visa and MasterCard credit cards, and is open every day from 5pm until early in the morning. 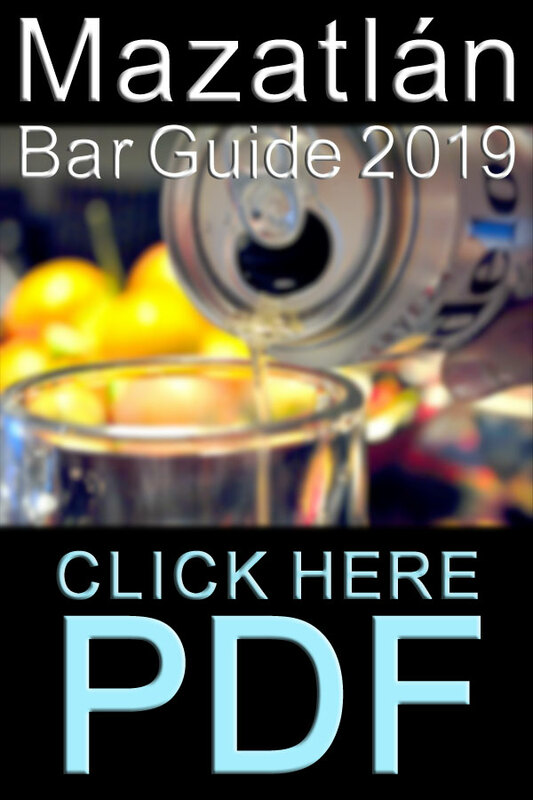 El Presidio in the Mazatlan Centro Historico is a sophisticated upscale Mexican and international restaurant that is the creation of Chef Diego Becerra, founder of the popular Diego's Beach house. Located at the corner of Niños Heroes and Mariano Escobedo, El Presidio is housed within the spectacular Casa Garcia, a distinguished Mazatlan historic building that has graced the heart of the Centro Historico since 1876. Casa Garcia was also the home of Chef Diego's great grandmother, and he has brought to its restoration the love that family connection brings to the re-purposing of this marvelous space as an intimate sophisticated dining establishment. Chef Diego trained in Mexico City, and brings a worldly fusion complexity to all of his culinary creations, whether it is a mole and duck burrito, Mexican fried noodles topped with grilled zarandeado shrimp, roast chicken with chipotle and vanilla glaze or black angus ribeye steak with habanero and lime butter! Many guests at El Presidio choose to dine inside, but few escape the draw of the courtyard. After dark the spectacular courtyard-greenhouse populated with fig, laurel, mango and banyan trees, is softly illuminated by candle light. Whether for a before-dinner drink or an after-dinner coffee, simply a great place to relax under the stars. 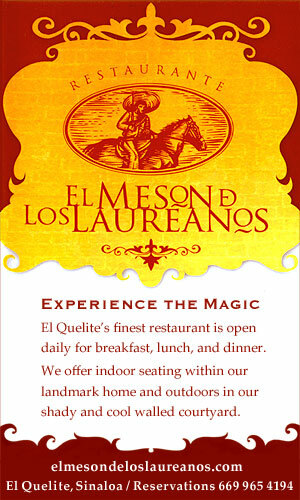 El Presidio is open from 6pm to about midnight Monday - Saturday, Visa and MasterCard credit cards accepted. Gus Gus Mexican restaurant in Mazatlan is located in the Golden Zone - Zona Dorada, across from the Costa de Oro Hotel. Gus Gus has a sidewalk café feel to it, although it is mostly covered. Gus Gus serves many delicious Mexican dishes, snacks, and reasonably priced beer. Many evenings Gus Gus offers live music. Long a Golden Zone party favorite, Gus y Gus in Mazatlan has opened a second location at the Marina. This delicious outdoor traditional Mexican restaurant has been a favorite in the north Golden Zone for many years. Very inexpensive, Juanita's in Mazatlan offers simple and perfectly prepared Mexican dishes daily from early morning until after dark. Beyond traditional breakfast favorites like yummy spicy Huevos Rancheros, Juanita's makes all sorts of fish, chicken and beef tacos, larger fish entrees, and mouth-watering quesadillas. Juanita's does not serve alcohol, but does deliver. Karnes en su Jugo in Mazatlan serves a wide variety of traditional Mexican foods, and is one of the longer-established restaurants in Mazatlan Mexico. Carne en su jugo is a form of slow cooking that yields a delicious bowl of a meal that is something between a soup and a stew. Originally from Guadalajara, these hearty meals are small pieces of flank steak cooked in their own juices with tomauntilos, garlic, chile, cilantro, and whole beans and crispy crumbled bacon. Try one heaping spoon full and it will make you a fan for life. La Callecita Cenaduria is located in Centro just a short walk south from Plaza Machado. As with many traditional Cenaduria's (the word literally means "eating house"), La Callecita is only open in the evenings, in this case from 6pm-11pm. This rooftop restaurant is a open-air dining terrace that is truly delightful -- if you can navigate the stairs! 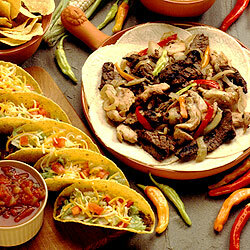 The restaurant serves excellent modestly priced traditional Mexican food that is prepared in an open kitchen. The La Callecita Cenaduria does not have a liquor license, but guests are welcome to bring their own! Fun and tasty, La Casa Azul (formerly Los Tejabanes Restaurante) is a great choice for Mexican dining in the Golden Zone / Zona Dorada. Sometimes referred to as Roman's Place, La Casa Azul serves traditional Sinaloa cuisine in a relaxing environment. La Casa Azul is open from 8am until 6pm, Visa and MasterCard credit cards accepted. La Catrina Restaurant & Cantina in Mazatlan is a fun restaurant - bar that will satisfy your hungers. Specializing in Mexican seafood and traditional Sinaloan dishes. La Catrina is located in the large palapa that was formerly the home of the Purple Onion, and has both indoor and outdoor seating. The restaurant is open from 1pm - 11pm Sunday through Wednesday, 1pm - 2am Thursday, Friday and Saturday, and has a parking lot. Parking and take-out available, Visa and MasterCard credit cards accepted. La Cocina de Ana Mexican restaurant in Mazatlan is worth finding -- it can be a bit difficult, your Pulmonia driver can help! Once you've found La Cocina de Ana you will go back many times -- this unpretentious restaurant is one of the best places in Mazatlan for a good home cooked meal. La Cocina de Ana is set up buffet style, and the large bowls of soup and specials are wonderful. La Cocina de Ana offers many different freshly prepared Mexican dishes daily. You can eat there in Ana's sunny kitchen or let them pack it up for takeout. You are charged by the weight. La Cocina de Ana is a lunch spot only, and is open Monday - Saturday, 12pm - 4pm. La Cocina de Ana in Mazatlan is very inexpensive. Cash only. La Fonda at Villas El Rancho Beach Resort is located just north of the marina in Nuevo Mazatlan within the El Rancho Green Resort -- enjoy great Mexican food in a relaxed atmosphere! La Fonda at Villas El Rancho serves breakfast, lunch, and dinner. Specialties at La Fonda include seafood and traditional mexican dishes. Their Parrillada -- an exquisite combination of lobster, shrimp, and fish -- is a feast for two that's to die for! Located on Cerritos Beach, La Fonda at Villas El Rancho has a spectacular beach and ocean view from its slightly elevated location, parking is available, credit cards are accepted and the restaurant is open from 8am until 9pm, daily. La Fonda Santa Clara in Mazatlan was located right on the Malecon overlooking Olas Altas beach, and was a mainstay of Mazatlan dining since it was founded in 1963. Remodeled and re-opened as La Fonda Chalio, this very popular Mazatlan restaurant -- especially for breakfast -- continues to draw a nicely mixed client�le, usually a blend of Mexican professionals, toursits and ex-pats. Beyond great -- modestly priced -- breakfasts, La Fonda is known for superb chiles rellenos and two great Mole dishes, Mole Poblana and Enchiladas en Mole. Both of the latter dishes are served with truly delicious home made mole sauce using many ingredients imported from Puebla -- half way across Mexico -- the birthplace of Mole. La Fonda Chalio has both inside and outdoor seating on the Malecon. In the evenings La Fonda often has live music from very good Mexican Greatest Hits bands that do remarkable renditions of popular songs from the 60's, 70's, and 80's. Open for breakfast, lunch, and dinner, La Fonda Chalio is one of the more frequently recommended Mexican restaurants in Mazatlan, and contunues -- like its predecessor -- to thrive without a telephone! La Hacienda de la Flor Mexican restaurant in Mazatlan has a large and loyal client�le. Located in the Mazatlan Golden Zone - Zona Dorada within the Royal Villas Resort, the aroma of exquisite Mexican spices will greet you as you enter Hacienda de la Flor. Experience the complex flavors of the La Hacienda de la Flor mole sauce that is made from 35 spices and takes two days to cook. For breakfast, try the scrambled eggs with chopped cactus or a breakfast tamale, and for lunch or dinner, consider a La Hacienda de la Flor prime fillet stuffed with sauteed potatoes in avocado sauce or mushroom-stuffed crepes! La Hacienda de la Flor is open daily for breakfast, lunch, and dinner, and provides free WiFi. La Taquiza del Cheff are clean, bright family-style Mexican restaurants that serve some of the best tacos in Mazatlan. Both La Taquiza del Cheff locations deliver to most places in Mazatlan, and party / event catering is available. The original La Tramoya Mexican restaurant on the Plaza Machado in Mazatlan's Centro Historico offers hearty Mexican dishes and offers both indoor and outdoor seating on spacious sidewalk tables. Ravenous? Try the La Tramoya carne azteca -- a steak stuffed with huitlacoche (corn fungus) and served on a bed of nopales (prickly pear cactus): a truly spectacular traditional Mexican combination of flavors. Owners Helena Tirado and Marcela Gonzalez de Rico ensure that the service at La Tramoya is always excellent, and this Centro Historico Mexican restaurant favorite is one of our most consistently highly recommended Mexican restaurants in Mazatlan Mexico. 2010 brought a special treat for those who live in North Mazatlan: La Tramoya opened a modern new location on the marina behind the Costa Veleros Condos on Avenida Sabalo-Cerritos with the same menu as the original location. Both La Tramoya locatios have full bars, are open for breakfast, lunch and dinner, and accept Visa and MasterCard credit cards. Los Zarapes is a perennial Golden Zone Mexican restaurant favorite. Indoors, Los Zarapes has traditional Mexican decor -- with the addition of televisions -- and its second floor location (accessible by elevator) also offers ample outdoor seating overlooking the beach. The large menu is mostly traditional Mexican, and the portions are large as well! Los Zarapes is open for lunch and dinner, and stays open until very late -- past midnight on weekends. The restaurant has a full bar, and accepts Visa and MasterCard credit cards. There is often music and entertainment later in the day, and secure parking is provided around back in a private lot off Calle Pulpo. Located on the ground level of the luxurious Casa Lucila Hotel Boutique, Lucila's Restaurant serves up delicious Mexican food with a splash of International cuisine in a sleek European setting. The bar and restaurant overlook the sweeping Pacific Ocean, and feature a generous patio, ideal for al fresco dining. Guests can dine on traditional Sinaloan dishes such as Beef Tongue in Chipotle Sauce, Enrijoladas with Fresh Cheese of El Habal, or Machaca with Eggs -- or they can get a taste of Europe with the Pizzette with Gambaretti and Pasta Pomodoro served up with a Mexican flair just to name a few! Lucila's Restaurant is well stocked with a variety of international wine and spirits and features a fantastic 2x1 Happy Hour Monday through Friday from 2-5pm. 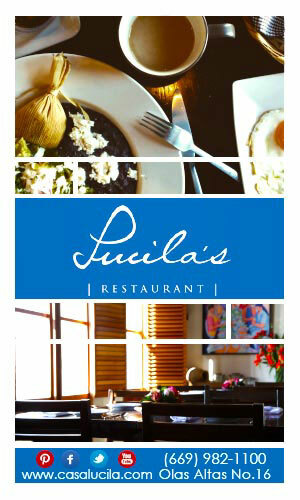 Lucila's Restaurant serves breakfast, lunch and dinner from 7:30am - 10pm every day, closing at 5pm only on Sundays. Located right on the beach at the El Rancho Resort in the Golden Zone, this small welcoming palapa restaurant serves delicous Mexican meals, especially seafood dishes. The dining area is glassed-in, which is very nice on windy days! Lupita's has a full bar, and is consistently recommended for its good service. Margaritas is a Golden Zone dining mainstay, and a great place to go for breakfast, lunch, dinner or drinks. Located in a shaded courtyard that spills out onto the beach between two buildings in the heart of the Golden Zone, Margaritas Mazatlan has an extensive menu featuring all sorts of traditional Mexican dishes, as well as delicious steaks. Open every day from 7am until 11:30pm. Longevity is a yardstick of quality, and Molokay is one of the most successful restaurants in Mazatlan -- this delightful rustic Stone Island restaurant gem has been serving fresh Mexican seafood to tourists and locals since 1954! Located on the beach, Molokay serves some of the freshest fish in Mazatlan -- the fishermen are pretty much in your line of sight -- and all sorts of other fresh seafood prepared Mexican-style, especially their amazing shrimp dishes. Suggestion: start off with a bit of coconut milk served right in the coconut before you progress to a Pacifico. You won't regret it. Open Monday through Friday 9am until 5pm, Saturdays and Sunday 9am until 7pm. Located overlooking Playa Bruja at the northern tip of Nuevo Mazatlan, Mr. Lionso is a great place to eat delicious Mexican food in a relaxing palapa setting overlooking the ocean. 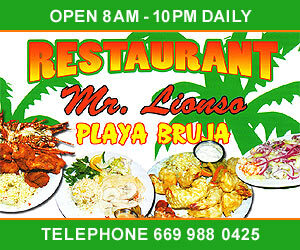 Mr. Lionso serves a wide range of well-prepared traditional Mexican dishes. The view of Playa Bruja is spectacular, and particularly fun when Surf's Up as this is a favorite surfing location. Take your pick of Mexican favorites: Lobster, shrimp (or the lobster and shrimp combo! ), garlic scallops, amazing grilled steaks or spicy chicken dishes. The restaurant often has live music and -- music or not -- the service is consistently good. The well-stocked full bar has everything you could possibly want to drink. Mr. Lionso in Mazatlan is owned by Leonso Aramburo, who founded the restaurant in 1995 and is a mainstay of the Playa Bruja scene. Sit in the cool shade, enjoy a great margarita, and dream the afternoon away. Mr. Lionso provides free WiFi. This Mexican seafood restaurant serves breakfast, lunch and dinner, is open from 8am until 10pm 365 days a year, and accepts Visa and MasterCard credit cards. Getting to Mr. Lionso at Playa Bruja is a breeze even if you don't have a car and / or don't want to take a taxi: Just take the Cerritos Juarez bus north from the Golden Zone - Zona Dorada and get off at the last stop. If you don't feel like making the trip up to Playa Bruja, Mr. Lionso also has a location right in the heart of the Centro Historico on the Plaza Machado. Same great menu, same great prices! Located in the Golden Zone on on the beach, Pancho's Restaurant opened in 1985. The owner, Francisco Lizarrago -- affectionately nicknamed "Pancho" -- had been a waiter at the Costa d'Oro Hotel and started his establishment with just a few tables. Now, over 25 years later, the restaurant has grown into a two story Golden Zone Mexican food mainstay, and operates in two other locations as well, the second being in the northern Golden Zone, and the third being an outlet in the Gran Plaza Mall. Pancho's offers an extensive menu of Mexican food and a substantial wine list made up of mostly Mexican, Chilean and Spanish wines. There are many seafood specialties including Camarones Pancho -- a delicious taste treat where fresh jumbo shrimp are wrapped in bacon and fried, topped with cheddar cheese, and drizzled with a mouth watering shrimp sauce. Pancho's is also famous for their Pescado Zarandeado -- red snapper combined with tomatoes, green peppers and onions and cooked to perfection in its own natural juices! Pancho's is open for breakfast, lunch and dinner from 7am - 11pm daily, and accepts Visa and MasterCard credit cards including -- unusually -- American Express. Pancho's is one of the most consistently recommended Mexican restaurants in Mazatlan. Next time you're cruising Avenida del Mar and feel a bit peckish, drop into Paradilla Charly and enjoy some excellent, inexpensive, beef grilled Mexican-style. Paradilla Charly in Mazatlan serves everything from carne asada tacos to tender t-bone steaks, and if you're in the mood for something a bit different they offer quesadillas, gorditas, queso fundido, burgers, fries, and delicious Sinaloa-style hot dogs. Open from 5pm until 2am daily. Pedro y Lola Mexican restaurant in Mazatlan is located on the Plaza Machado in the Mazatlan Centro Historico, and is named after the beloved Mexican singers Pedro Infante and Lola Beltran. Housed in the over 150-year-old Juarez Building -- an important stop on our Centro Historico Walking Tour -- Pedro y Lola in Mazatlan serves regional dishes such as molcajete (chunks of arrachera beef with grilled nopales, onions, and fresh panela cheese) in a wood-beamed dining room. This very popular sidewalk restaurant also serves delicious Mexican seafood dishes like garlic octopus and fish papillote (fish wrapped in parchment and steamed in white wine). Pedro y Lola is open from 6pm - 1am, daily, accepts Visa and MasterCard credit cards, and has an extensive bar and wine list. The restaurant is well known for its great live music, as this sample from the Lori Davidson Trio headed by expat Mazatlan resident Lori Davidson performing her composition Follow The Sea clearly attests. Many customers believe that Q Cotorro Tacos restaurant -- almost universally referred to as "Tacotorro" -- in Mazatlan makes the best tacos they've ever had! Q Cotorro Tacos Mexican restaurant in Mazatlan is simple -- an open-air building with plastic chairs and no liquor license -- but the crowds that pack Q Cotorro Tacos are here for the tacos! Tacotorro is especially known for their Caramelo taco made with cheese and sirloin, on a corn tortilla, the meat so tender and juicy that it will completely spoil you for tacos back home. Save a bit of room for the coyotas -- big, tasty sugar cookies! Q Cotorro Tacos provides free WiFi. Raymundo's Papas and Taco Stand is legendary in Mazatlan! Located two blocks west of Plaza Zaragoza at the corner of Zaragoza and Uribe, this lost-established taco stand perfectly straddles the line between awesome street food and a sidewalk restaurant. Yes, there are tables, but the restaurant is set up and taken down daily, with the food cooked on mobile carts. Raymundo's can make all sorts of delicious tacos and other traditional Mexican foods, but their specialty is Papas Locas (Crazy Potatoes), and many Mazatlecos, ex-pats, seasonal visitors and savvy tourists believe that Raymundo's makes the best papas locas in Mazatlan! The potatoes are very large and -- because of the wide variety of salsas and fillings offered -- can definitely be made into healthy and filling vegetarian meals. Raymundo's does not sell alcohol, but diners are welcome to bring their own. Open from 6pm until about 11pm Monday - Saturday, Raymundo's is very inexpensive. Cash only. Restaurant Playa Norte in Mazatlan is located just south of the Fisherman's Monument, on the Malecon. A long-established Mazatlan eatery, Restaurant Playa Norte serves a wide range of Mexican food, with an emphasis on seafood. The food at Restaurant Playa Norte is good, but the real draw is the view, which is fantastic! Sefe's -- sometimes referred to as Torta Sefe's -- is a Centro Historico Mazatlan Mexican restaurant jewel! Founded in 1989 Sefe's has a devoted client�le who love their simple well-prepared inexpensive Mexican food. Intimate and very clean, Sefe's offers diners a full view of the kitchen and the preparation of your meal. Beyond Mexican food, Sefe's serves really great hamburgers and outstanding french fries. Sefe's is open from 7:00am until late afternoon Monday - Saturday, and opens at 10:00am on Sundays. They also have a very active take-out and delivery business. The creation of Diego Becerra -- founding chef of Diego's Beach House -- Tacos El Chilillo in Centro is a true masterpiece of Mexican street-style cooking. At Tacos El Chilillo pork, beef and more is slow-roasted, shredded and packed into hot fresh-made tacos and tortas. These very inexpensive tacos and tortas are cooked to perfection and made with the finest ingredients -- many believe that El Chilillo serves the best tacos in Mazatlan. But enough words: watch a taco being born at Tacos El Chilillo! Somewhere between a restaurant -- there are tables -- and a street stand, Tacos Escorpio by Henry serves some of the best tacos in Mazatlan! With complimentary bean soup, chips and salsa, this inexpensive taco stand fills diners up fast with delicious tacos -- served with grilled onions and peppers -- and other tasty treats like smokey grilled chicken (Pollo al Carbon). If your interested in trying Papas Locas there is no better place to do it than Tacos Escorpio by Henry in Mazatlan: their steak-stuffed potatoes are legendary! Tacos Escorpio by Henry serves beer, and there is no corkage fee if you bring wine. Open daily from 5pm - 11pm, cash only. Very inexpensive tacos in the heart of the Golden Zone. And don't forget to wash your authentic Sinaloa tacos down with an authentic vanilla-flavored Sinaloa soft drink, Toni Col! Taqueria Playa Sur in Mazatlan is an excellent Mazatlan Taqueria. If you want juicy carne asada and a multitude of trimmings and salsas, this is the place! Very clean and just south of the Centro Historico, this is the best of what Mexican tacos are supposed to be! Open from 6pm until way after midnight. The Place, El Paraje Mexican restaurant in Mazatlan is not only a very inexpensive, popular place for tourists, but is the home of the American Legion post in Mazatlan Mexico. The Place, El Paraje specializes in Mexican food at dinner, with wonderful American-type offerings for breakfast and lunch. The restaurant is located on Camarón Sábalo just north of Oceana Palace Hotel in the Golden Zone - Zona Dorada. The Place, El Paraje has a large area in the rear, with dance floor, bar, and pool table. Tomates Verdes Mexican restaurant in Mazatlan is comfortable and casual, and serves traditional Mexican food like Pechuga Rellena (stuffed chicken breast) and flavorful authentic Sinaloa soups like Nopales con Chipotle (spicy cactus). The menu isn't particularly extensive, but everything is delicious and modestly priced. Tomates Verdes is located in Mazatlan's Golden Zone - Zona Dorada. The restaurant is open Monday to Saturday From 9:00am to 5:00pm. One of the most elegant restaurants in Mazatlan, Topolo restaurant delivers excellent food and great wines. Topolo restaurant and bar is about the beauty of a garden setting and the delicious flavors of old and contemporary Mexico. Since its 2005 opening, Topolo in Mazatlan has delighted diners with its beautiful garden, complex and robust dishes and seductively intimate atmosphere. Topolo is set in a classic Centro Historico home close to the Plaza Machado, and brings together the contemporary and ancient flavors of Mexico in beautifully presented seafood, poultry and beef dishes that celebrate Mexican cuisine and feature the freshest and most seasonal ingredients. One of the more highly recommended Mexican restaurants in Mazatlan! Topolo is also home to Habanero's Wine Bar, one of the most sensual and elegant drinking spots in Mazatlan.